Downtown Miami real estate has become increasingly popular during the past several years thanks to a number of new condos and its central location. 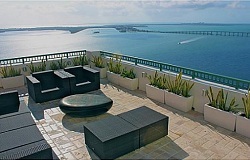 Newer luxury condos in Downtown Miami include 900 Biscayne Bay, Everglades on the Bay, Marina Blue and the Ivy. Although separated by the Miami River, Brickell is commonly considered to be part of Downtown Miami real estate and condos. Midtown, part of Downtown Miami, is also quickly becoming one of the most popular destinations in South Florida. Thinking About Buying or Selling in Downtown Miami? Nobody knows Downtown Miami and Midtown real estate better than The Jo-Ann Forster Team, your trusted Miami Realtor. We have been successfully selling real estate in South Florida for over 30 years and have a proven track record for delivering exceptional service and results for our clients. Give us a call today at 305-468-4558 or use the form below to contact us by email and let us know how we can help you.